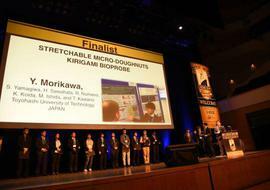 Yusuke Morikawa, a first-year doctoral student in the Department of Electrical and Electronic Information Engineering, has been awarded as a Student Paper Award Finalist. 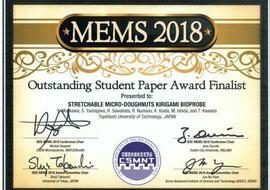 This prize is awarded to especially outstanding papers presented at the international conference 'MEMS 2018' with an adoption rate of 51%, and the final decision was made by the conference's Technical Program Committee (TPC) through a strict screening and voting process. This year's conference received a total of 675 submissions, and this paper was chosen out of the 10% of papers to be presented and was one out of only 14 papers to receive this award.